Here are my wee pepper plants. Left to right: Chocolate pepper-one; Lilac pepper that turns red when ripe-three; Orange pepper-oneish. I say "ish" because it's lost one of its leaves and I'm hoping it puts out more leaves or it won't survive. I have four sunflowers. I forgot to tell Pam to water these guys when I went to Wisconsin on business and they were wilted when I came home. Plus, I didn't get 100% sprouting as I would have liked. 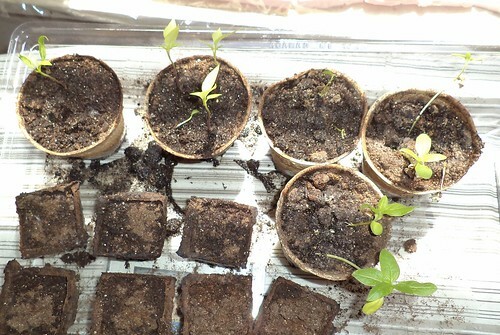 I think I will hit the nurseries this coming weekend and look for more orange or chocolate pepper plants that are stronger than my little ones here, just to be on the safe side. I also want to get a large pot for them as the one I was going to use has those accidentally overwintered dianthus in it. I'll post a photo of those tomorrow. I am quite surprised at how sturdy they are. They look really good. The weather is supposed to be nice this coming weekend. I'm itching to get the chairs out on the deck and the flower pots filled. I should get another can of stain but that might be a Memorial Day project. I stumbled upon a list of heirloom peppers that I think I will try next year. I just need to write them down some place so, in January, when I'm ordering seeds, I remember to get them. I can almost taste the peppers I'm going to get in August.